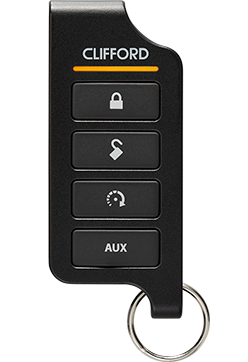 Clifford’s elegant new LED transceivers mark a giant leap forward in 21st century vehicle security and remote start, and an evolutionary milestone for the keychain remote. 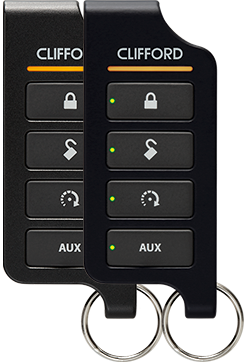 These slender & sophisticated 2-Way remote controls feature a clean sleek ergonomic industrial design, made to fit the user’s hand comfortably, enabling effortless and intuitive single-handed operation as LEDs confirm your commands. Great unit. Works like a charm. However, after having my vehicle battery replace, the unit seems to be stuck in a 'valet' or other mode. 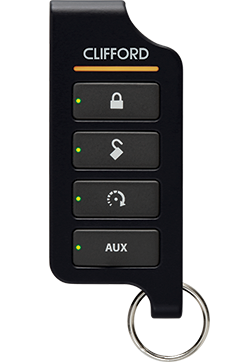 I can arm/disarm system (it give an additional beep not), but remote start no longer functions(the led for remote start and the top led flash and I get a tone on the clicker). I feel like I've missed something in the instructions on what to do after replacing the vehicle battery.